What separates your best employees from the average ones? The practical skills that make them more effective in virtually every situation. Your best people cause intended results with each conversation. Their written communication is clear, concise and produces the desired work product by the time they need it. 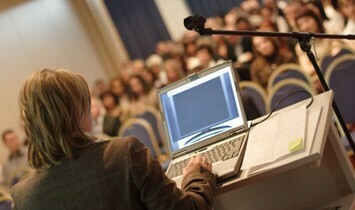 They can present to a crowd and elicit the response needed. They make meetings a productive use of employee time. They hold others to account, without creating fear. They manage their time and resources well, network in the professional community and coach others to greatness. Too bad there aren’t more of them, right? Fortunately for you, your average employees can gain the skills and techniques to achieve all the attributes you appreciate in your most valued team members. And your life and theirs will be better for it. In this course, your people will learn the art of managing each conversation to cause an intended outcome, and build an effective working relationship with another individual. Participants explore communications skills, including types of conversation and where conversations break down, and learn the three models for communication. The process of communication is outlined and details what should happen before a conversation, to begin a conversation, during the conversation and to end the conversation as well as how to handle challenging conversations. The communications skills workshop ends with group role play and coaching to reinforce the communication tips and techniques learned. Schedule your workshop today, and be relieved of the communication breakdowns all around you. examine the process for writing to cause results. Writing tips and editing exercises teach your people to clearly and concisely tell the story. To reinforce the techniques, volunteers share their business writing and receive on-the-spot feedback on their business writing effectiveness and suggestions to improve. Schedule your workshop now, and write your own future. What is a powerful presentation? A powerful presentation engrosses the audience, enrolls people in a desired belief, and most important, spurs an action to move initiatives forward. 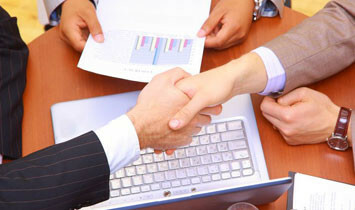 make the look of a presentation support the objectives. To reinforce the techniques learned, participants prepare and give a 5-minute presentation to the group, and receive on-the-spot coaching for the benefit of the group. You know there’s a need, so why put it off any longer? Contact us today. Ask employees what pet peeves they have about their workplace, and you’ll find excessive and unproductive meetings at the top of their lists. 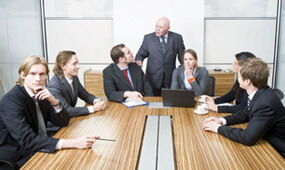 Yet, surprisingly few people have ever taken a workshop on how to run a meeting, despite the high cost to the business. 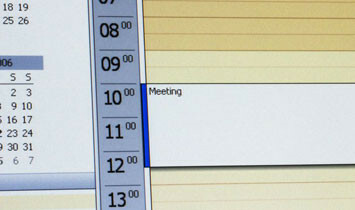 The reality is meetings are overused because when in doubt about what to do, a meeting is generally called. Worse, the meeting typically has no or a poorly constructed agenda and no real defined purpose other than to tell people what is happening. The Meeting Mastery workshop brings this overuse to the forefront as participants learn how to reduce the number of meetings attended and make the necessary meetings highly productive to work for them and the organization. Participants learn if and when a meeting should be called, and how to manage preparation so the meeting is useful, how to run the meeting, participate productively in a meeting, prevent wasted meeting time, and create clarity about accountabilities and the next steps decided in the meeting. Further, participants will discuss the many alternatives to having a meeting and learn tips for managing dysfunctional behaviors that detract from the meeting when in session. Why tolerate meeting mania one moment longer? Contact us today. Ready to Kickstart the future. Our workshop participants tell us they truly intend to meet their deadlines on the job. But then, things happen, and they can’t seem to get it all done, despite their best efforts. Their email is flooded. New demands are placed on them. Team members fail to meet their deadlines for work integral to the promised project. And so on, and so on. Since the whole team is drowning in this time management swirl, they tend to collectively accept it as “the way things are.” Not having found a time management book that alters this reality, the team members reach an unspoken, unofficial agreement that it’s unfair and unreasonable for anyone to fault them for not making every deadline. And then, everyone is off the hook. And the big picture – your vision — is undermined. In this workshop, participants examine and explore the undiscovered capabilities in common workplace calendar and task software and other best practices to communicate and manage commitments – their own as well as those of others. They begin to relate newly to the functionality and management of email, calendars, meeting requests and task lists – and regain control over their time and priorities. Applying what they learn, they free themselves up to work more productively, earn peer respect, and reclaim their weekends and personal time as they learn best practices to ensure they never have more than 25 emails in their inboxes. Contact us now to schedule your workshop, and get your life back! 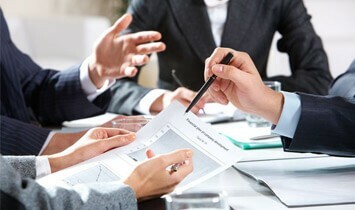 Team and department leaders often realize the need to provide seasoned unbiased facilitation and coaching support for their teams to tackle specific issues and reach objectives unique to their functional and collaborative groups. One-time or multiple sessions can be designed to forward company goals that have been hampered by a group facing particular challenges and setbacks. Let us hear from you today, and we’ll help you design a program that’s right for you. Whether technical sales, professional service consultants or straight-out commissioned product sales, people who must get the purchase order to make their numbers often struggle to be as effective as they could be. Conducted for small groups as well as individuals – many of whom invest in their own coaching outside of company-funded training – Be-a-Closer Sales Rep Coaching supports your sales staff in overcoming the areas where they are missing the opportunity to close the prospect. While it varies for everyone, we most commonly see similar issues and patterns. Failure to understand and articulate the true customer need and drivers leaves prospects feeling unheard and uninterested. Or, the sales person presents the product or service as if talking to himself, unaware of the unique perspective of the buyer. And, all too often, the sales rep fails to recognize closing signals, and distracts the ready-buyer from saying yes. Once a business development professional has experienced this highly-personalized, intensive coaching, they often return for deal-specific coaching on their next big presentation. OnwardU helps each one develop a sales and closing strategy to fulfill on their investment to secure a meaningful opportunity. Make the sale. It all starts with a call or email now. Think your group needs one or more of our workshops? We can help you build the most effective, cost-efficient course series for any size group, timeline and pace. Or, just take one workshop at a time. Might some of your important initiatives and meetings benefit from the skills and leadership of a professional, third-party facilitator trained to ensure good listening, full participation by all, and focused conversation toward a meaningful result? 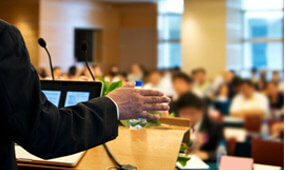 Need a presenter for a group or directed attention for one or more key players?